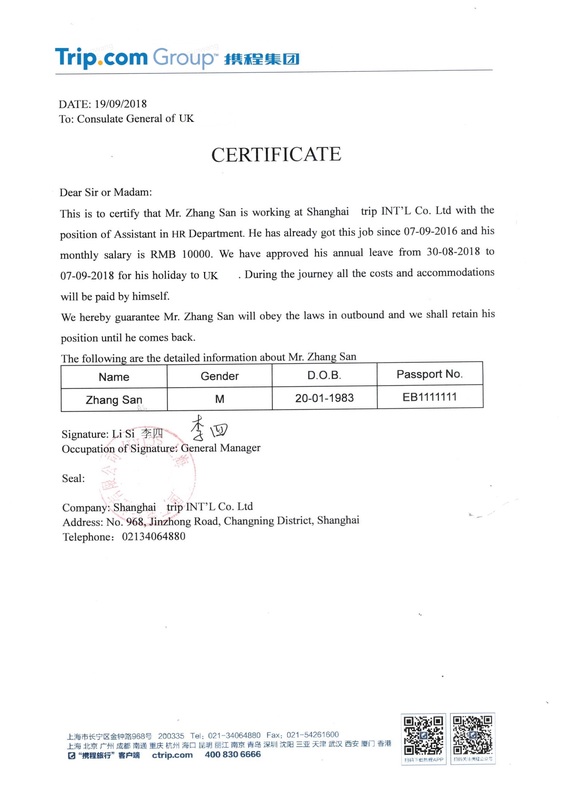 This is to certify that Mr./Ms.选择正确的性别 本人姓名拼音 is working at 公司英文名称 with the position of 职位英文名称 in部门英文名称. He/She选择正确的性别 has already got this job since入职时间日日/月月/年年年年格式 and his/her选择正确的性别 monthly salary is RMB月收入数目用阿拉伯数字表示. We have approved his/her选择正确的性别annual leave from此次行程的出发时间日日/月月/年年年年格式 to 此次行程的返回时间日日/月月/年年年年格式 for his/her选择正确的性别 holiday to 申请签证国家英文名称. During the journey all the costs and accommodations will be paid by himself/herself选择正确的性别. We hereby guarantee Mr./Ms.选择正确的性别 本人姓名拼音 will obey the laws in outbound and we shall retain his/her选择正确的性别 position until he/her选择正确的性别 comes back.